Where to Buy Prodiamine 65 WDG, Prodiamine 65 WDG Generic Barricade - 5 Lbs - $54.59 for Sale with Fast Free Shipping! Prodiamine 65 WDG Generic Barricade - 5 Lbs is a broad spectrum pre-emergent herbicide that labeled for broad range of use sites, turf species and weeds controlled. Duplex Infiltration Soil Surfactant - 2.5..
Trapper Mini T-REX Snap Trap for mice - 5.. When I applied this generic yet powerful herbicide last year, it worked wonderfully on my crabgrass issues. Dissolves easily without any clogging issues and I can not argue with the price. As long as you follow the label dosage, I believe this product will satisfy most customers. I am looking forward to applying it this year as well. Excellent pre emergent and it is at a great deal right now. This product works wonders all the time. I always get the results I want. Amazing stuff. Great value. Shipping was on-time and it bottle was packaged very securely (sealed/padded oversize envelope inside relatively thick cardboard box). Been using it for a while, having had extremely satisfying results with it, any long as it keeps on working I'm just ganna keep on buying them. Very good luck with this for couple of years now. my favorite preemergent herbicide for crabgrass! this is one of most efficient pre-emergent herbicide, it works beautifully. I use Prodiamine 65 WDG (Barricade) because it works! and is very economical! 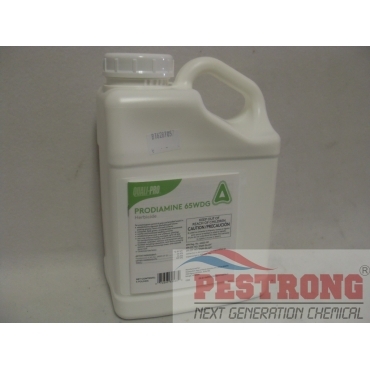 I rotate Prodiamine 65 WDG with Pendulum so as to keep the weeds from becoming immune to one or the other. Hard to find locally, it's a great generic alternative & great value! Fast shipping, great price and we love doing business with Peststrong! I did not have any trouble spraying this with a boom sprayer, did aggressively agitate, better than expected. First time using product, will see next spring if did well. Plan to also use again in fall winter. Two treatments / year keep southern lawns weed free. Best price out there for a great product. Will buy again! This is best cost effective pre emergent herbicide in the market. Pestrong provides lowest price plus free shipping. Thanks. Hard to find locally. Fast shipment. Great price. The product works great. Work really good as described said. Can't beat prodiamine as a pre-emergent for the price. Go with highest label rate if you don't want to worry about the product breaking down too soon due to an excessively rainy season. No staining is pretty nice too. Prodiamine 65 WDG order was received quickly. The product was as described and was applied very easily. The longest pre emergent on the market. I use it on the lawn, in the mulch beds, sidewalk cracks, and on gravel. One app can last up to 8 months. At the 8 month application rate, 1.5 lbs of product will cover an acre. This jug will cover 145,200 square feet. This is best! Barricade is very useful pre emergence herbicide to control for my account. I had been using Barracade.....this works just as good at a lower cost! Fast 'n Free Delivery to boot! really worked at preventing new growth behind my house.